I went rogue on this week’s Cook the Book Fridays recipe. First of all, I was having trouble picturing this layered and baked “soup” that the original recipe seems to be. Secondly, my husband loves butternut squash but doesn’t eat bread, so I couldn’t figure out how to make this into something he could enjoy too. I had my “a-ha moment” when I realized I could puree the onions, butternut squash, and broth into a delicious soup, and then top off my serving with bread and cheese. So, the recipe as written, has one layer toasted sourdough bread with cooked onions, broth, thinly sliced butternut squash, herbs, and generous amounts of cheese. It’s baked in the oven until everything is cooked through and the top is nicely browned. To make my version, I cooked the onions as instructed. When it came time to add the broth, I also added cubes of butternut squash. I simmered it all until the squash was very soft. Then I added the herbs and pureed the whole thing with an immersion blender. I topped my bowl of soup with cubes of toasted sourdough bread, then topped the bread with shredded Gruyere and Parmesan cheeses. I ran it under the broiler until the cheese was melted and beginning to brown. For my husband’s soup, we just topped his soup with the cheeses. It worked! I felt like my version of the soup was in the spirit of the original recipe, and my husband really enjoyed his. Win, win! If you would like to try Butternut Squash Bread Soup, with or without my modifications, you can find the recipe on page 163 of David Lebovitz’s book, My Paris Kitchen. I have to admit that I have never been drawn to Gazpacho. The idea of cold tomato soup just isn’t very appealing to me. But, since this is Cook the Book Fridays, I willingly made this week’s recipe, Gazpacho with Herbed Goat Cheese Toasts. One thing that did appeal to me about making this recipe was that I was able to use home grown tomatoes. It seems like a recipe featuring tomato is the perfect match for garden tomatoes. I made a change to the technique: rather that boiling the tomatoes briefly to peel them, and then pushing the tomato pulp through a strainer, I just ran them through my food mill. I’m not sure it saved me any time, but for some reason I find the boil-and-peel method to be tedious, and I also got to use one of my kitchen toys! The herbed goat cheese toasts were an interesting contrast to the goat cheese we made a few weeks ago. This was the “quick and easy” version, while the other recipe required at least 24 hours. Both versions were good, and both have their place. I was pleasantly surprised by the gazpacho! It was very flavorful, and the olive oil and my San Marzano tomatoes added a richness I didn’t expect. My husband loved this soup, and has requested it a couple times since I made it last weekend (alas, we don’t have enough garden tomatoes for it right now). I gave a small bowl to my daughter and she liked it too. I still don’t think I will ever crave gazpacho, but I now see it as a nice way to enjoy tomatoes from the garden. Happy Friday! To those of you in the U.S., I hope you had a wonderful Thanksgiving! I am here in Seattle visiting family and we had a delicious feast yesterday. 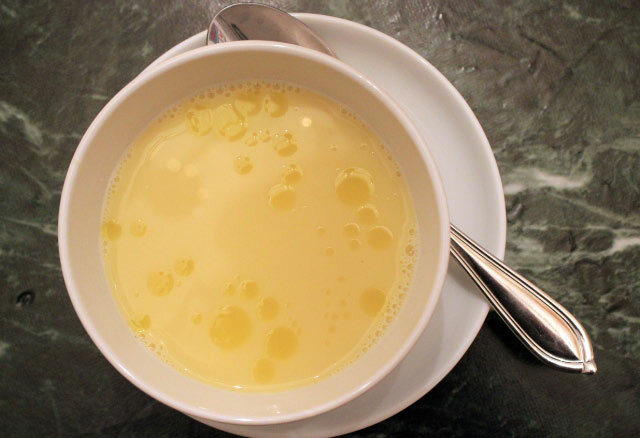 We’re rounding out this month’s French Fridays with Dorie selections with another soup. 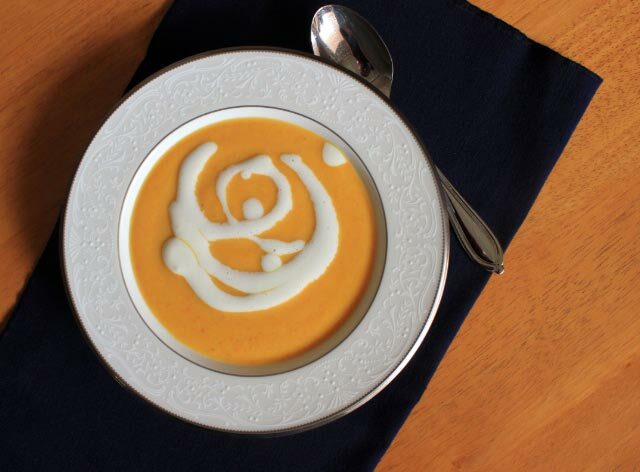 This one is squash soup, specifically Beatrix’s Red Kuri Soup. 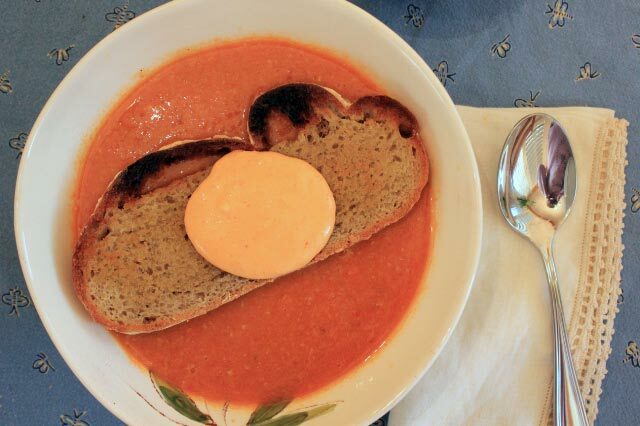 According to Dorie, her Parisian friends look forward to this soup all year long! They love the sweet, chestnut flavor of the squash. See that pointy top? Mine didn’t have that at all. If I ever find (or grow!) 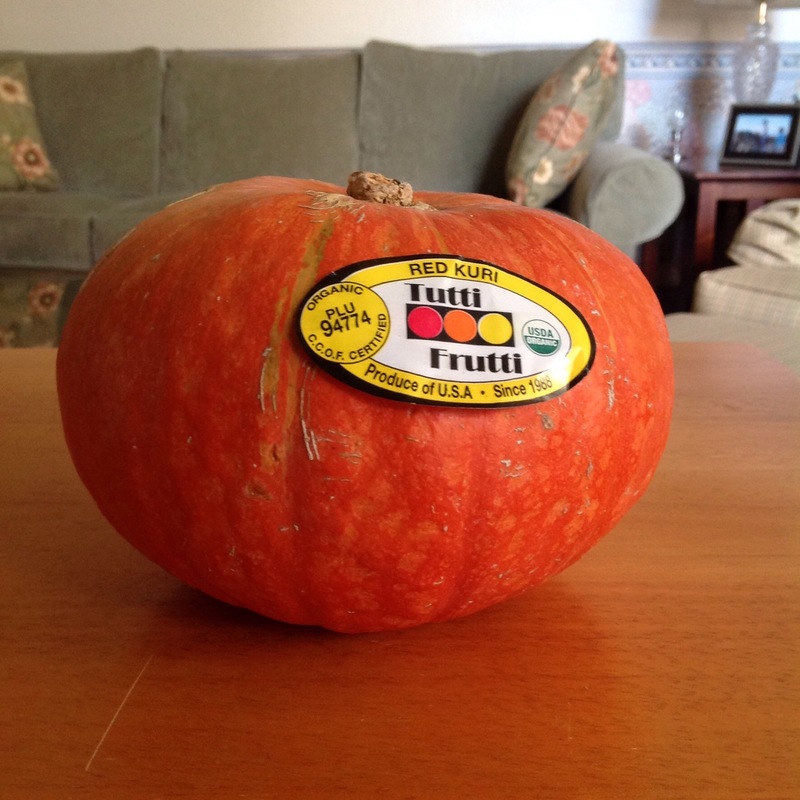 a red kuri squash that looks like the image above I will try this soup again to see if it tastes different. Anyway, did we like the soup? Not really. It didn’t have much flavor, and I was expecting this soup to have a special flavor after the build-up Dorie wrote about in the lead-up to the recipe. My husband said we might as well have been eating boxed soup. Ouch! I can’t help but think it was the squash that wasn’t right. I had part of the squash left over, and I roasted it as a side for dinner another night. The roasted squash also did not have much flavor. 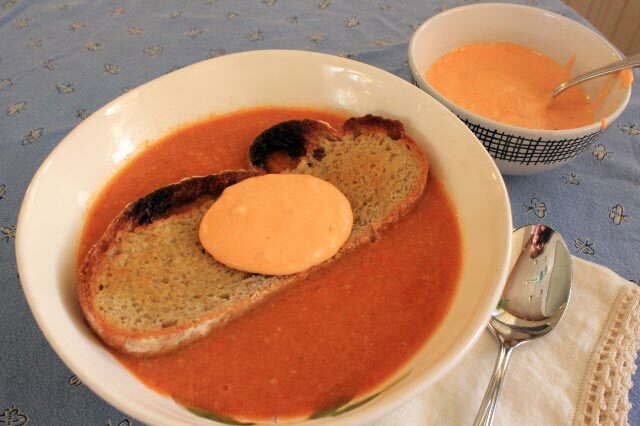 If you are certain you have a real red kuri squash and want to try this soup, you can find the recipe on Dorie’s site: Red Kuri Soup. Happy Friday! Here we are at the last French Fridays with Dorie recipe of July already. Does anyone else feel like this summer is flying by? This week we made Provençal Vegetable Soup. Soup seems like an odd thing to make in the middle of summer, but this one is chock full of summer vegetables. What vegetables are in this soup? Here is the long list: onion, garlic, carrots, potato, green beans, zucchini, tomatoes, and fresh corn. Add to that some pasta and cannellini beans, then top with pesto, basil, and Parmesan cheese. For an all-veggie soup, this one is quite hearty! I was able to use several herbs and veggies from our garden: rosemary, potato, tomatoes, and basil. Even the pesto came from last year’s garden. Now, we’ve been having some hot weather here in Reno. We had a couple weeks over 100°, and soup really doesn’t sound appealing when it is that hot out. Thankfully, early this week we had a patch of cooler weather, and the day I made my soup it was a little cloudy and rainy, with a high of *only* 85°. We loved this soup! To me, the pesto really makes the soup. Even though the corn is non-traditional, we felt that it really added a nice flavor and texture. This soup is a winner for sure. Maybe I’ll make it again in the Fall when the weather is a little cooler? This post participates in French Fridays with Dorie, and online group cooking our way through Dorie Greenspan’s Around My French Table. If you would like to try Provençal Vegetable Soup, I highly recommend getting this wonderful book! It’s Friday once again! Where does the time go? 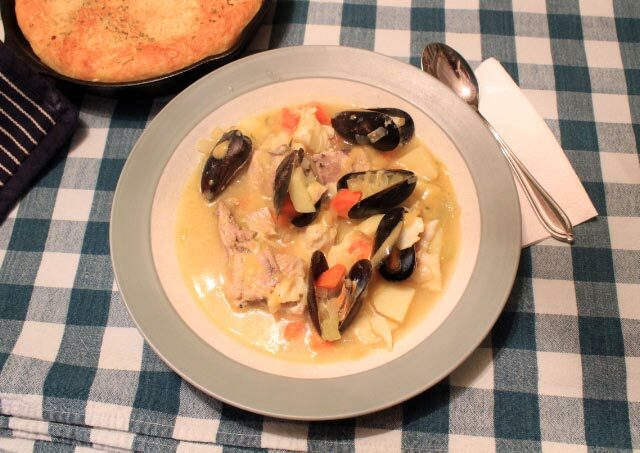 I was concerned that this week’s French Fridays with Dorie recipe would fall inappropriately on a warm Spring day, but luckily (for the soup, anyway) our weather cooled off quite a bit this week. We made a simple soup called Vegetable Barley Soup with the Taste of Little India. The “taste of Little India” comes from the spices: ginger, turmeric, and garam masala. The rest of the ingredients are very basic: onion, carrots, parsnips, garlic, barley, and chicken broth. After Trevor (of Sis Boom Blog!) mentioned on Facebook that he wished he had added chicken, I decided that chicken was something we needed. I simmered two small boneless, skinless chicken breasts with the rest of the soup and chopped them up when they were cooked. We enjoyed this hearty, yet light, soup. I was happy with my choice to add the chicken. Next time I would use a little less ginger; I felt the flavor was a bit too strong. I was looking forward to seeing if the flavors mellowed a bit after an overnight rest in the fridge, but unfortunately I accidentally left the pot of soup out on the stove overnight. Quite frustrating, as I hate to waste that much food! This would be a great recipe to use when you need to “clean out the fridge”. Many vegetables and meats would work well with the barley and spices. I will be out of town next week visiting my family in Seattle for Spring Break, so I won’t be making next week’s recipe, and I might not be able to comment on other soup posts. However I did make a catch-up recipe this week that I will be sharing with you next Friday! It’s Friday once again! 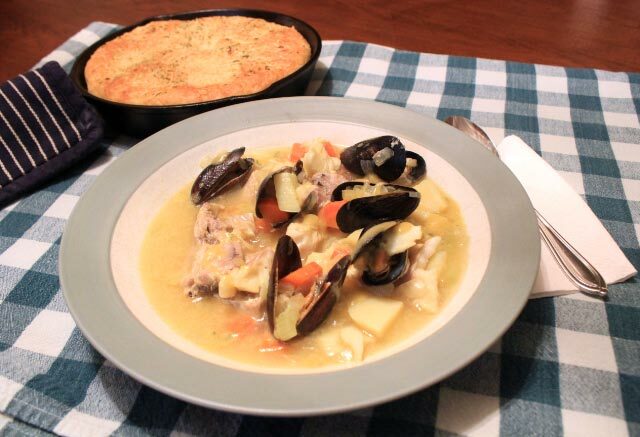 This week’s French Fridays with Dorie recipe is called Garbure From the Supermarket. 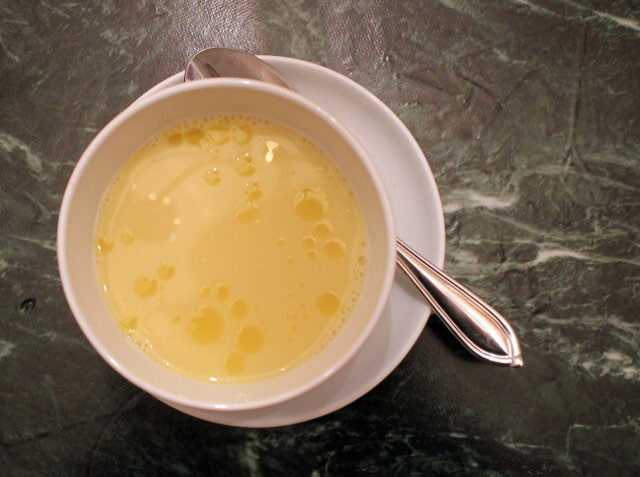 A garbure is a rustic soup, usually containing beans, cabbage, potatoes, and duck confit. Since duck confit is not easy (or inexpensive) to find in the United States, Dorie came up with this version using ingredients more readily found here. Dorie gave us several options: 1) pork shoulder or ham bone; 2) an optional duck leg; 3) an optional sausage; and 4) a variation using duck confit. I went with 2 small ham shanks, no duck, and no sausage. Also, I had some Christmas Lima Beans on hand, so I used them instead of the navy or cannellini beans. Otherwise, I stuck with the recipe. As I read through this recipe I had one big concern. This soup simmers for 3 hours, and the vegetables (carrots, celery, turnips, potatoes, and cabbage) are cooked that entire time. I was concerned the vegetables would turn into mush, and a fellow Dorista confirmed this fear. So, I added the veggies at the half way point. I still felt that they were overcooked, so next time I would only cook them for the last hour. I really liked this hearty soup. I was happy with my choice of using ham shank, but I would love to try it with pork shoulder and a sausage someday. Having this soup simmer away all day made me wish for wintery weather (my apologies to those of you on the East coast…). I could picture myself and family holed up in a cozy cabin in the snow with this soup to keep us warm.